Even when sometimes violent protests erupted, the only librarian on staff, Scott Bonner, kept the library doors open. And when he reached out for help via social networking, many volunteers as well as supporters around the nation joined him in preserving the one glimmer of light during a very dark time in this community. Although Mr. Bonner had only assumed his position in July, he had already developed a relationship with local businesses and the community by opening the library as a meeting space. During a recent interview, Mr. Bonner explained he had “a very broad definition of librarianship.”  That’s why the Small Business Administration, through Bonner’s invitation, had previously used the Ferguson Library as a staging point to meet with business owners affected by storm damage in order to offer emergency loans. As Ferguson’s sole librarian with a staff of several part-time librarian assistants and one part-time administrative assistant, Bonner operates in much the same way as many small public library directors. Bonner wears many hats, library director, children’s librarian, reference librarian, all rolled into one. In August, however, he could never have anticipated how broadly he would define that concept of librarianship, and as a result, elevated that concept, too. About what to do next. When area schools closed, with the help of volunteers, the library offered classes to up to 200 school children with nowhere else to go. It offered computer access to residents who had none. It offered the news media a place of respite. With the help of some volunteers , Bonner created healing kits for children. In one of many interviews, Bonner conceded that “if I had any sense, I should have shut down.” Yet he has continued to deliver an important message about libraries and being a librarian. He emphasizes that what he did was “not notable, just noticeable”. In interview after interview, Bonner reveals the character, values, and strength of conviction that shaped his decision to remain open and that also shape his role as a librarian. As he responds to the many questions asked about his decision, his responses always speak to the need to serve the community, to provide information services, and to foster free and open communication. Ashley Ford of BuzzFeed tweeted that the Ferguson library would be open and solicited donations. “We all know that books save lives, please donate…” Saves lives. That resonated with the world in the midst of a town infuriated by the loss of life.Authors, Neil Gaiman and John Greene joined her as did Reading for Rainbows. It seemed that everyone admired this little library’s courage. Donations keep coming in. Right now, donations exceed Ferguson’s $400,000 yearly operating budget. Mr. Bonner looks forward to hiring a Children’s Librarian this year. “Thanks to her efforts, we’re going to have one of the strongest collections in the state for civic engagement, civil rights history, and recovering from trauma,” beams Bonner. 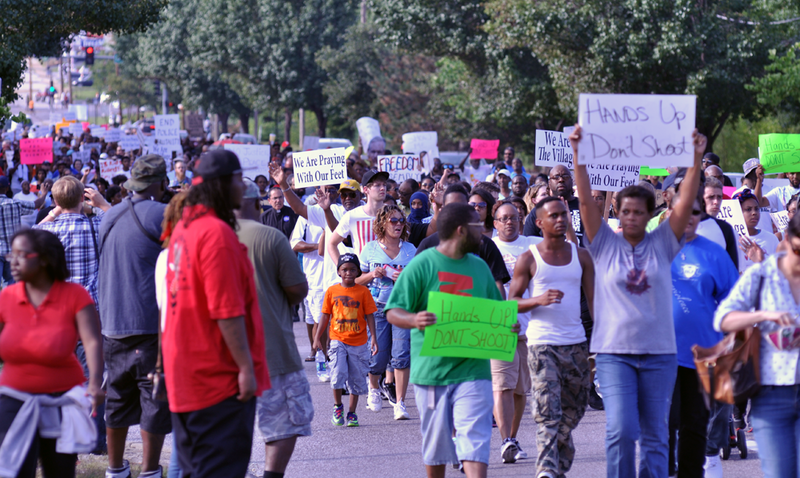 No one can dispute his courage during the chaos and conflict in Ferguson. Buildings burned several blocks from the library building and the doors still remained open. As a librarian, Bonner’s courage extended well beyond physically opening those doors. His actions, along with his insights about librarianship might have opened minds about the role of libraries. It certainly highlighted the important role the Ferguson library played in the lives of that community in crisis. One little library, one big librarian, one shared vision and dream: Libraries can transform lives. They serve communities.Every day. As Mr. Bonner so humbly puts it,“Some days, it’s not notable and on those, when we’re noticeable, we are very necessary and very valuable”. Bonner, Scott. 2014. Twitter message from Ferguson Municipal Public Library. (#Ferguson Library@ferguson library). August 15, 2014, 6:07 PM. Axelrad, J. (2014, December 10).